Some couples keep it simple and just pick a wedding color or two, but others prefer to get creative and come up with a theme for the entire wedding. A great theme is any subject that the bride and groom have a special interest in, or one that seems to represent the relationship in some way. 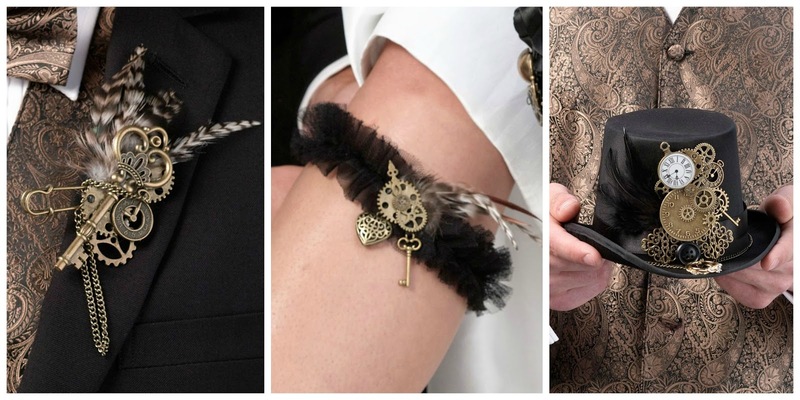 One really fun theme that we carry creative wedding accessories for at WhereBridesGo.com is Steampunk. Steampunk is categorized as a genre of science fiction. It has a historical setting, often Victorian England or America's Wild West, and it incorporates re-imagined modern technology in a way that is inspired by 19th-century industrial steam-powered machinery. These new creations often end up being quite fascinating and elaborate works of art, fashion, and mechanics. You will see lots of gears, wheels, glasses, top hats, and metallic colors. Many of the inventive designs cleverly combine vintage elements with a futuristic look. You can theme your wedding in many tasteful ways that won't make it look like a child's birthday party. Combining your chosen subject with the elegance of a wedding can be done with small touches here and there that will pull everything together in a way that your guests will be excitedly talking about for years to come. 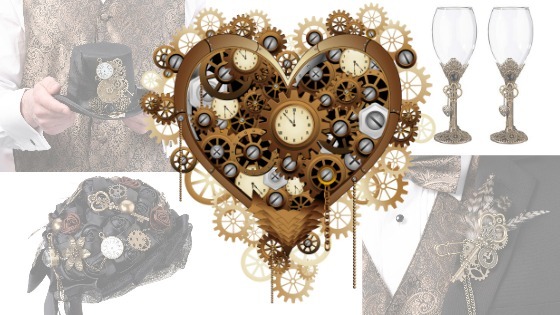 Specialty clothing is a big part of any steampunk theme. Replacing some of your florals with mechanical elements is an excellent way to incorporate this genre, like with the groom's boutonniere and the bride' bouquet. 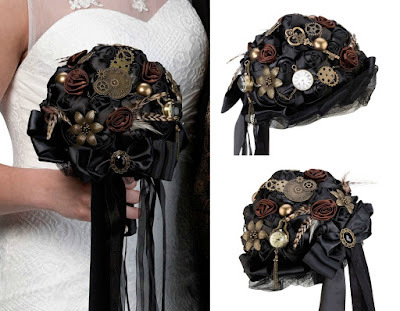 Our Steampunk Wedding Bouquet is filled with satin flowers, metal gears, feathers, broaches, and other decorative details in a gorgeous combination of black and antique bronze. Hidden elements are a fun surprise too. A few gears fit perfectly on a bridal garter! The one available on WhereBridesGo.com features a bronze heart along with the "key" to it. Make sure you incorporate tops hats too. We offer an adorable Steampunk Top Hat Ring Holder for your ring bearer to "hide" the rings in to take down the aisle. You can duplicate the look we described for the bouquet above and create fantastic centerpieces for every table. In the creative spirit of the genre, make each of them sightly different from each other. Add extra touches in areas where guests will be focusing their attention. They'll definitely notice our Steampunk Card Holders if they want to find their seat! The toasts and the cutting of the cake are moments when all eyes are on you again, and lots of photographs will be taken. Those are great places to add some more mechanical elements for everyone to marvel at. If you love steampunk, there is a very good chance that the members of your wedding party, your closest friends, are fans too. You can find a few gifts for groomsmen in our online wedding store. 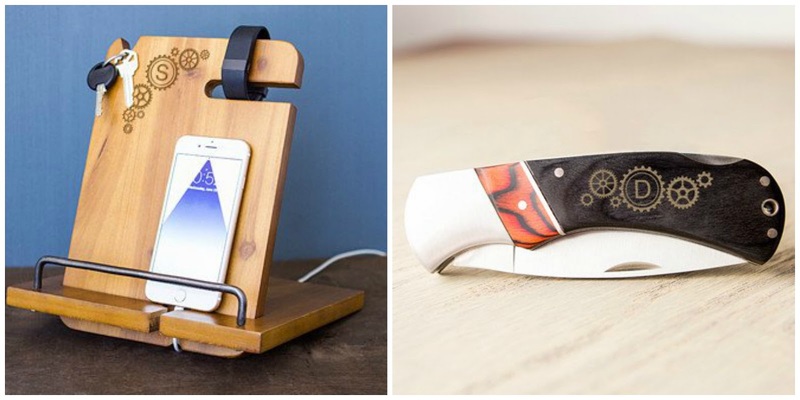 There's an incredible Steampunk Two-Tone Wood Handle Pocket Knife that can be personalized with a single initial. Our Steampunk Wooden Docking Station isn't just for the fellas, and could be a wonderful gift for bridesmaids too. This multi-functional wooden item features a slot for watches or bracelets, a keychain notch, and a groove along the bottom for charging cords. This can also be personalized with the recipient's initial. If this theme sounds like something you would love to incorporate into your wedding, go to WhereBridesGo.com and type "steampunk" into the search bar at the top. 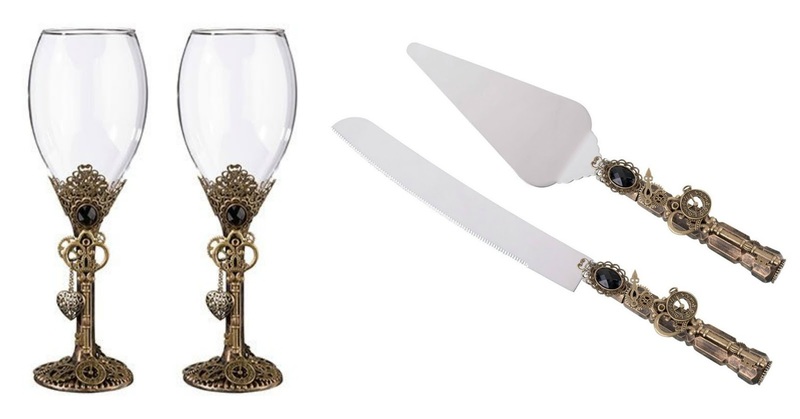 These items in our online wedding accessory store may inspire many more marvelous ideas of ways that you can bring your unique personality into the elements of your wedding.